15" Glass Beaded Placemat by KINDWER - 15 inch/15 in. Flora Design placemats in a beautiful beading technique to resemble a blossum in full bloom, add these placemats to any table to dress it up in gold. 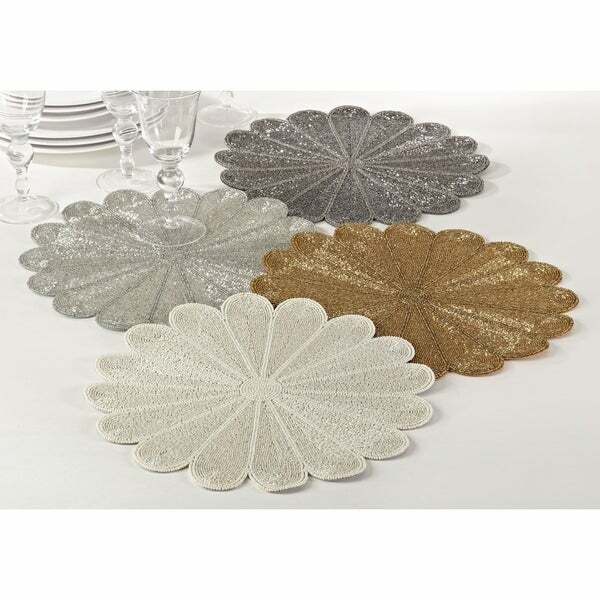 These placemats are perfect for everyday entertaining. Dimensions 15.0 In. X 15.0 In. X 0.5 In. I love these placemats. They are perfect for my dining table giving it an elegant look. I looked for a long time to find something that would compliment my table; these did it!! 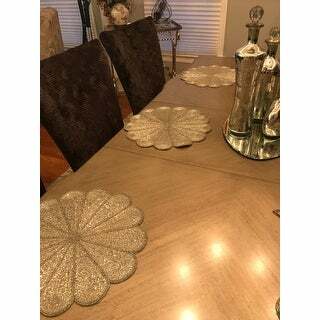 These beaded placemats are really cute. One mat had a few beads missing, but was replaced by another mat. I love these placemats - they are very good quality and look fantastic on my table! Great quality, just what I was looking for. Beautiful on my dining room table. They are lovely. Elegant with the right material on the back side. No room for improvement. I love them! Will definitely recommend. These look perfect in our gray and white motif. Added glam to our beachy look. "Do the beads remain intact? My current placemats have loose bead ends." "Do these placemats come in white?" Unfortunately no, the place mats are not available in white. Looking for something pretty in silver. These seem to fit the bill.